Since the fourth and last edition of Number was published, a half-century ago, mathematics has advanced with astonishing speed. Several of the most outstanding unsolved problems have either been solved or spread roots to new places in nearby fields. From the time our ancestors first discovered rules for operating with numbers, problems of mathematics cropped up; some were solved, others not; but, like stones in ancient Phoenician barley fields, new ones surfaced faster than the old were removed. Yet, despite developments in modern number theory and analysis, the content of Number is still as fresh as when the first edition was published in 1930. Reading Number today, the mathematics enthusiast is struck by its lucid language, contemporary relevance, and intellectual provocation. Progress in mathematics has accelerated. On the surface, it may seem as if only a few famous problems have been solved in the past 50 years. But modern mathematics has increasingly become more profound. Solutions to surface problems--the so-called 'gems'--are inextricably linked to others that are often fields apart, crossing boundaries by intricately tangled roots coming from one great and stable unifying source. The ancient problems of doubling of the cube, trisecting the angle, and squaring the circle remained a mystery for two thousand years, waiting for the brilliant ideas of modern algebra to uncover their proofs. In 1837, Pierre Wantzel proved that it is impossible to duplicate the cube or trisect an arbitrary angle, thereby solving the two great mysteries of antiquity. Was that the end of the long story that began with the tale of the oracle at Delos, which claimed that relief of the devastating plague in Athens would come when the cubic altar to Apollo would be doubled in size? Certainly not! Wantzel's solution opened new questions, questions on which simple algebraic criteria would permit geometric constructions as solutions of rational polynomial equations. These questions, in turn, opened the far broader question of how to convert geometry to the theory of equations. 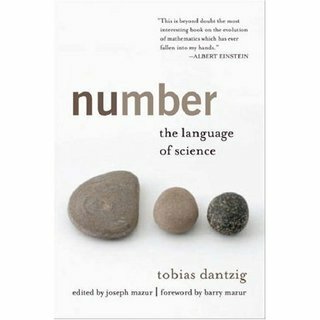 Dantzig focused on the evolution of the number concept to keep his book well within a manageable scope, staying reasonably clear of the more geometric branches of mathematics, even though he knew that answers to some of the most elementary questions of number theory are sometimes best handled through sophisticated geometry. His book mentions the Goldbach Conjecture, the Twin Prime Conjecture, Fermat's Last Theorem; three of many outstanding statements, still unproven at the time of its last printing. Fermat's Last Theorem was solved late in 1994, but the other two conjectures remain unsolved. The Twin Prime Conjecture, for example, is one of a large assortment of problems prompted by asking simple, phenomenological questions about how the collection of prime numbers is distributed among all natural numbers. The wonderful thing about many of the finest questions in number theory is that they can be stated so simply. They require little or no technical language to understand and can often attract the least-suspecting visitor, who--if not careful--may find him- or herself absorbed in endless hours of mathematical diversions. How many prime numbers are there of the form n2 + 1? How many prime numbers p are there with 2p + 1 being a prime number? Are there any odd perfect numbers? (Perfect numbers, such as 6, are equal to the sum of their own divisors.) We now know that there are none under 300 digits. But are there any? We know that if one exists at all it must be a sum of squares and at the same time have at least 47 prime factors. But are there any at all? There was a time when young, naive mathematicians (like myself) would worry about what would happen when all these fine questions--those simply stated ones--would be solved. We have learned not to worry. Not only will there always be enough fine questions to tempt the dilettante, but each answer will breed a family of new ones. Such was certainly the case with Fermat's Last Theorem, which reared much of modern number theory; it was also the case with those stubborn ancient Greek problems, which formed so much of modern algebra. We forever find ourselves at the relatively earlier stages of understanding number. Fifty years may seem like a long time to wait for solutions to outstanding problems, but considering that some have waited millennia it seems that plenty has happened in the mere 2 percent of the time since Euclid's Elements first appeared and modern mathematics took off. First, we'll look at how computers have affected mathematics. Then we'll take a peek at the progress on the Goldbach Conjecture, Fermat's Last Theorem, and the Twin Prime Conjecture.